Mega rare original first press. 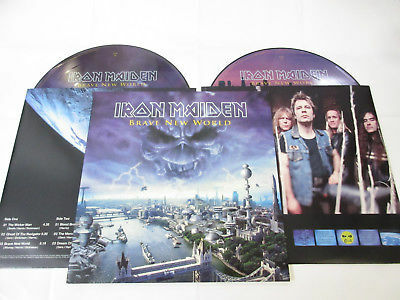 Double picture disc vinyl set in gatefold sleeve with printed inner sleeves. Near Mint to Mint condition! Both vinyl records never played! DO NOT SEND PAYMENT UNTIL YOU WILL RECEIVE INVOICE WITH CORRECTED SHIPPING COST. I ONLY SEND REGISTERED MAIL OR UPS. AND REMEMBER, FOR UPS WE NEED A REGULAR ADDRESS (NO P.O. BOX) AND PHONE NUMBER WHERE THE COURIER SERVICE WILL REACH YOU. DUE TO DELAYS AND LOST PARCELS, FOR SOUTH AMERICA I ONLY SHIP WITH UPS !!! BUYERS FROM SOUTH AMERICA HAVE THIS ON MIND BEFORE YOU BID !!! Keep in mind, that grading is always and only visual. MINT: The cover and any extra items are in perfect condition. The record itself is in brand new condition. Records advertised as “sealed” or “unplayed” should marked as Mint. If it is sealed, it is mentioned, otherwise it is new but not sealed. EX (Excellent): The cover and packaging might have slight wear and/or creasing. The record shows some signs of having been played but there is very little (if there is) lessening in sound quality. VG (Very Good): Normal wear and tear on the cover and extra items without any major defects. The record has obviously been played many times but displays no major deterioration in sound quality, but there are marks on the vinyl. G (Good): The cover has marks and or folding (it should be visible on the picture of the item). The record has been played so many times that the sound quality could have been noticeable deteriorated, perhaps with some distortion and mild scratches. Acceptable: Cover and record are in poor / bad condition. It is only used as a collection filler. There is always notice in the description if the extra items (insert, inner sleeve, etc) are included. FOR PACKING I USE NEW STRONG CARDBOARD FOR VINYLS AND BUBBLES. I ALWAYS PUT THE UNSEALED VINYL OUTSIDE FROM THE COVER TO AVOID SEAM SPLIT. I AM A COLLECTOR MYSELF, SO YOU DON’T HAVE TO WORRY. CHECK OUT MY OTHER AUCTIONS FOR MANY RARE & OBSCURE VINYLS, REISSUES AND NEW RELEASES. FOR PEOPLE LIVING IN ATHENS – GREECE I CAN ALSO ARRANGE HAND TO HAND DELIVERY.